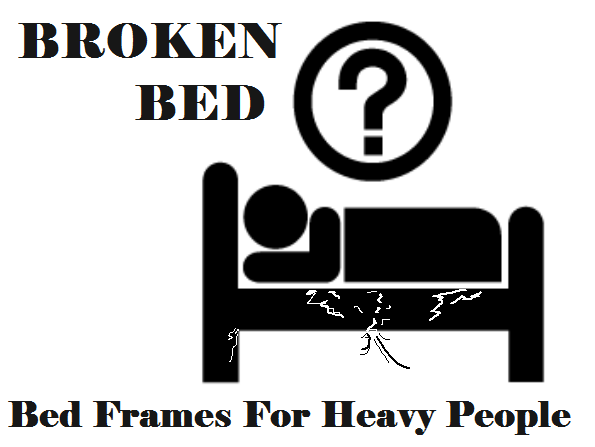 These sturdy bed frames for overweight people are available to buy online. They are a good replacement option for the inferior bed frames you often see in stores. Especially the 3500 pound capacity monster of a bed. The foundation of any bed is an important aspect to consider for longevity of the bed frame. I believe reinforced metal frames are the most heavy duty and appropriate for us overweight people. In particular the support bar where the slats rest/screwed into. If this bar is made of timber, even on a metal frame you could end up with some serious trouble down the track. It may hold for 6 months but once the daily usage of heavier weights takes its toll, the timber can pull away from the metal. Before you know it you’re up for yet another bed frame… So try to avoid wood slat support bars if possible is my recommendation. Size of the bed is another aspect to consider. Especially if you are prepared to spend the big bucks on a bed frame. One never knows when they need to upgrade to a bigger bed to accommodate an extra person. From our experience and much consumer research, it’s pretty obvious that King size beds are the predominate choice for the larger folks in the U.S.A. Bigger the better right?. Well that’s what we think, provided you have sufficient space in your bedroom of course. 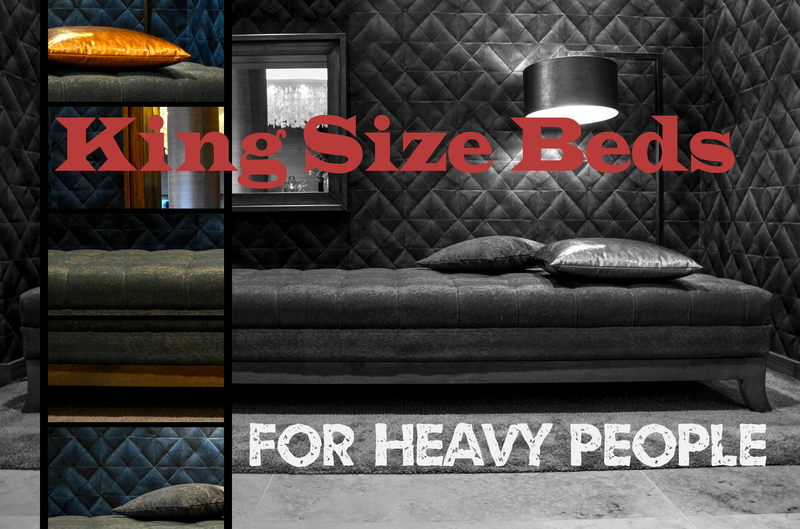 So we have compiled a separate list just for King Sized Bed Frames suitable for heavier people. I must say that I love these foundation solutions for maximizing any bed frames total capacity. It’s called the 45MinST platform bed. It can be used as a bed frame ready for a mattress straight away. Eliminating the need for a box spring. Or it can be used as a foundation if you already own a complete bedding frame. The 45MinST comes in most sizes and are highly durable with a huge weight capacity of 3500 pounds. What’s also very handy about this platform bed, is that it’s a great space saver. While the bed sits 14 inches high, you get a nice 12 -13 inches from bottom of frame to floor for storage. So most of the common 15-20 gallon storage containers can fit underneath. Freeing up space in cupboards for more important stuff. Or you can just store your winter blankets and so forth underneath. Overall I highly recommend this bed frame to anybody, especially if your a big Guy or Gal. 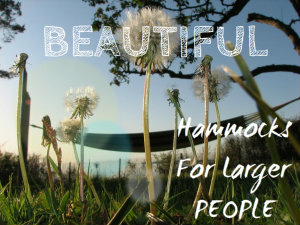 Because it has such a high weight capacity, it’s a should survive longer than some cheap and nasty bed frame. Assembly is super easy (not exaggerating here folks) and the frame is what I call whisper quite to sleep on. Here’s a tip tho: Make sure all the parts are tightly in position, as this is what often causes creaking noises in these type of beds. Also if you relocate this frame, be sure to check the tightness again because when you move the frame, the friction can cause the parts to loosen slightly. One of our favorites in the market place for sturdy bed frames with heavy weight capacities, is by Milliard. This bed frame in particular is ideal for big and tall people whom need a strong sturdy base for there box spring. The one piece solid support bar that runs down the center is a factor to holding such high level of weights. The interlocking pieces also act as extra strength for the overall sturdiness of the frame. With such heavy duty bars and support features, you might be expecting a heck of a time trying to assemble this tank of a bed frame. To my surprise, it’s rather easy and best of all. No tools are even necessary to put the frame together!. Although I think having a rubber mallet on hand is a helpful for gently tapping the pieces together. As a measurement guide, the queen bed frame has a width of 60 inches and has a nice good length of 72.5 inches. When you put a box spring on this frame, you get a clearance of about 7 inches underneath. Not huge, but better then being directly on the floor. It’s also worth noting that this bed is available in the usual sizes: King Size, Queen Size etc. Another point of interest for anyone wanting to buy this heavy duty bed frame is that it isn’t fitted with foot-board latches. Modify at your own risk. But you can add some head-boards to this frame. However if you have a rather tall head board, sometimes they tend to overhang the bottom and can make it difficult for the bed to roll on the wheels. Without modifying the boards attachments manually, you are essentially making the wheels useless. Which is a waste because they are monster truck wheels, no not really but they are built big and strong to withstand heavy weights. To see the complete list of big bed frames check out this guide here. I’m looking for queen box springs. Not a anything with legs on it. It has to fit in our log bed. We bought a bed with a minimum 1000 pound weight limit. Well my girl is 530 lbs and pear shaped and I’m 230 medium build. So king size we went with for the width and frame size for weight. First night we were excited and we bent the frame and now the bed squeaks! Now we’re on a mission to just break it! Here’s to good times being squashed and bed breaking!! Have you been able to find a box spring that will hold up with both of you? My boyfriend and I are about the same combined weight as you both. I’ve been looking, but there seem to be mixed reviews on everything. Hi – I am pleased that you offer these products for us larger folks. It’s great to be able to see a bunch of products suitable for us on one location. Thanks Bryan. 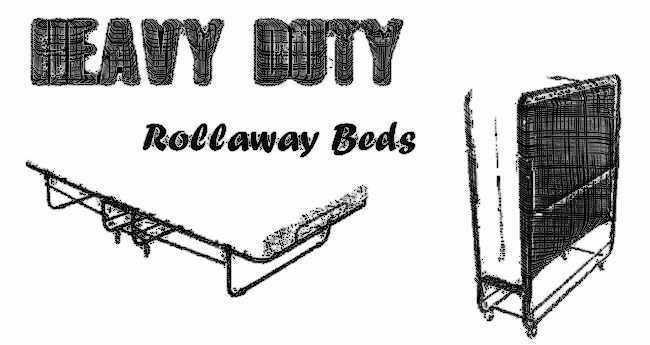 Previous post Heavy Duty Bunk Beds For Heavy People – Are They Really Safe?